I decided to sell a few of the brushes I had listed in my trade post. Please see the hyperlink for each brush to see individual pictures of that brush. This one might be a bit tough to move on. This is Vulfix Super, and frankly, it’s the only knot I would say is a mop. I’ve heard this term used for many brushes, but it’s the only type of hair I would give that distinction to. It still works just fine, but don’t expect to be blown away by the density. I used this brush once and bought it used from another user. Purchased this for $90, and will sell for $85. Rooney Beehive 2 Super Badger – SOLD! Lightning finally stuck and found that coveted Varlet Beehive I have wanted for so long. Varlet handle > Rooney handle. Being as this brush is the lesser density Heritage handles Rooney produced later on, the Varlet is superior as well in my preference for the knot. This feels good like the old heritage hair, but not with the crazy density the old Heritage 3-band had sadly. This could be a blessing as I find it much easier to work with, and is a great brush still. I am I believe the second owner of this brush. I can’t remember any other owners being mentioned, and can’t remember what I paid. Retail this goes for $179.95, and would like to sell this for $100. Chubby 1 in 2-band Super (Gray box) – SOLD! This brush is in that period of time that everyone wants so much in a Simpson 2-band being in the gray box, and having the England sticker. I found that this is quite similar to an earlier 2-band Simpson I had, and that the newer 2-band Silvertip compares quite nicely with the hair made in this period. I found this same hair in a size up is the reason for the sale. I used this brush once and test lathered it once. I am the second owner of this brush, and found no problems with shedding during the short time I have had it. I don't believe I asked the seller about shedding when I purchased it as it didn't even cross my mind. He did mention it hadn't been used in some time, and that matched with what he said when it arrived as it didn't look like it has seen much use. I paid $188 for this brush and would like to sell it for $180. Duke 1 in Best Badger [Shedder] – SOLD! The listing for this brush is just for the handle. I bought it with it being advised it was a shedder. It is indeed a shedder. Bright side it was a semi-cheap lesson, and hoping to lessen the expense of said lesson with this sale. I would like $20 shipped for this brush. These go retail for $76.40. 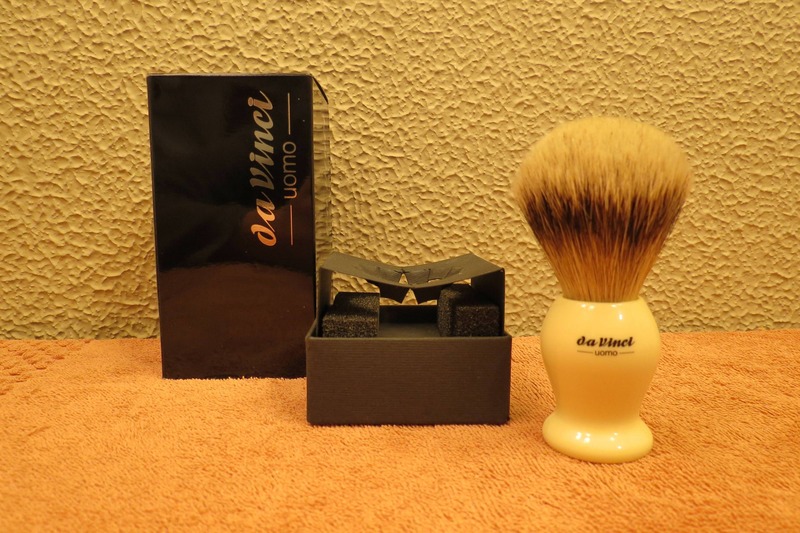 Da Vinci uomo 294 Silvertip shaving brush – SOLD! Brand new brush that has never been used. I picked this up from a vendor who had a nice sell on these. I planned to give this as a possible eventual brush for a nephew should he like wetshaving and take care of the equipment I give him, but still haven't gotten him to take the first of the stuff I have for him as he says he doesn't need to shave yet. lol I decided the boar and synthetic I have for him will more than do for right now, and no one needs to feel bad if those get broken, so up for sale this goes! The very front of this brush has a tiny bit of visual glue, but it was the best out of the two brushes I bought. You’ll have to look for it to see it. If this brush is anything like the other I use, you are in for some of the softest hair you’ve ever used in a brush. I paid $60 for this brush and will be selling it for $60. Buy with confidence. Joe is great to do business with. Thank you Charlie! The selling is picking up right now. I was able to get it from a member here and only selling it as I had the unimaginable happen and secured a wonderful Chubby 2 in 2-band Silvertip (Marked as Silvertip but it is the same 2-band Super as the Chubby 1 was). Still have that Mason Pearson. Price drop to $70. Please let me know if you have an interest in it!